Contains 99% organic ingredients – enhances coordination of mental and physical functions; supports balance between the heart and the brain; powerful antioxidant | Benefits according to ayurveda: •The three types of mental function: acquisition, retention, and recall •Metabolic transformations, digestion, the emotions and their effect on heart function •The mind, nervous system, respiration, circulation and elimination •Moisture balance, physical structure and strength •The junction points or gaps in the step-by-step transformation of the seven tissues – plasma, blood, muscle, fat, bone, bone marrow and reproductive fluid •The microcirculatory channels that transport nutrients and energy and can be blocked by improperly-digested impurities •The finest product of digestion and the master coordinator between consciousness, matter and immunity (ojas) •The vitality and strength of the mind and body | A precise, time-tested herbal formula: Amrit epitomizes the ayurvedic principles of sanyog – precise combination; and sanskar – meticulous processing. Thirty-eight rare whole herbs and fruits are combined in precise proportions in this powerful formula to create synergy – a whole that is more powerful than the sum of its parts. The ingredients read like an honor roll of revered ayurvedic herbs – amla, shatavari, dwarf morning glory, gotu kola … Amrit is still prepared using the age-old formula prescribed in the traditional texts and passed down by generations of ayurvedic physicians. It takes 250 meticulous steps to prepare. 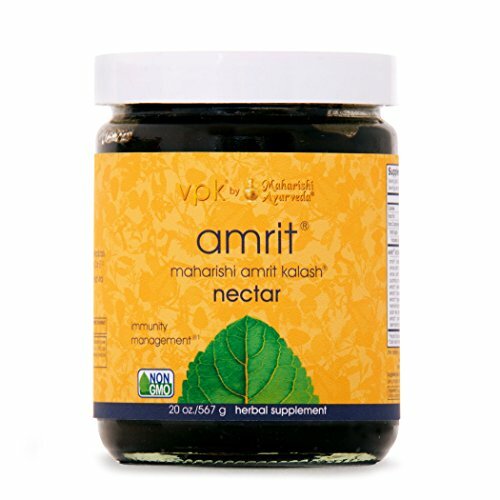 Twenty-two pounds of raw ingredients are required to produce a single jar of the Amrit Nectar. The herbs are slow-cooked to protect vital nutrients from high temperatures. This precise adherence to tradition and detail ensures that you get an authentic product of unparalleled quality.